The answer is yes, yes and yes, 1000 times yes. I get it, this is the very same question we asked ourselves before even considering hiring a car in Jordan. 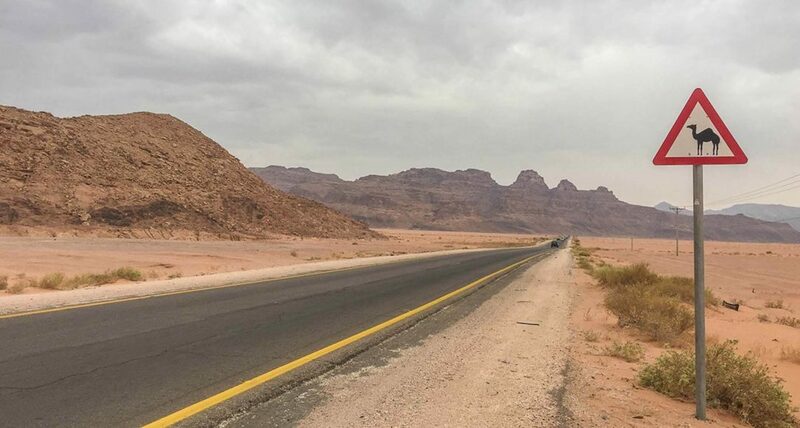 But the truth is, after a week road tripping between Amman, Petra, Wadi Rum, the Dead Sea and back to Amman, I can say with confidence that driving around Jordan is an experience on its own, a safe experience not to miss. If you are looking at touring around Jordan on your own any time soon, go ahead and bookmark this post. We collected a few tips that will surely make your experience more enjoyable. 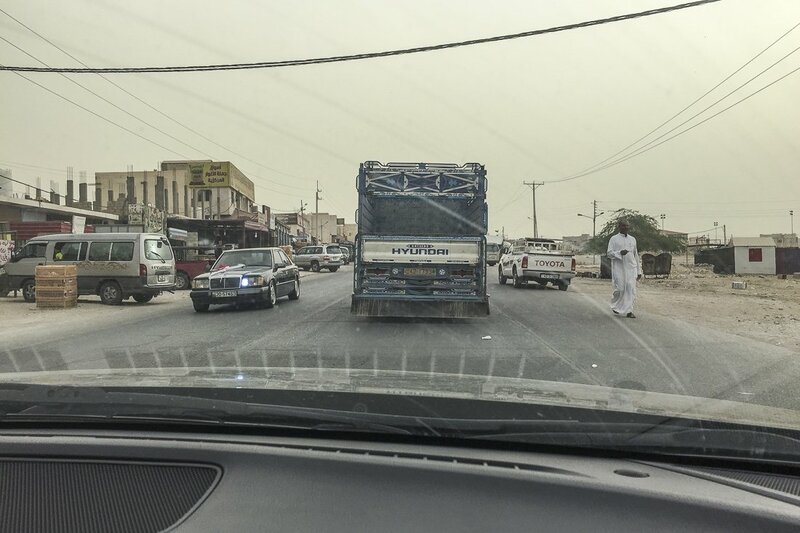 In case you were wondering, driving in Jordan is on the right. The legal speed limit on highways is 110 km/h, and police checks are quite regular. So don’t go too crazy on those long straight stretches along the desert routes! Signs along main highways and around main cities are in both Arabic and English. If signs are in Arabic only, there is nothing to see there. Now time for some trivia on car plates in Jordan. All rental car plates start with the prefix 70, immediately after a green rectangle with yellow letters reading “Jordan”. This is how you identify fellow rental car drivers on the road. Also, the smaller the suffix of a car plate, the wealthier the owner. Well, in fact, the more expensive the actual plate registration is. There! Road trip game anyone? 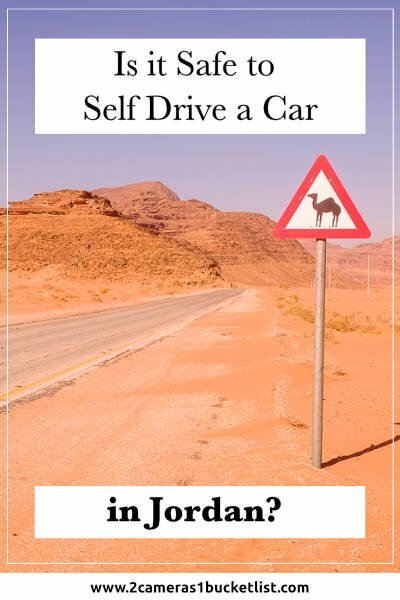 Self-driving a car around Jordan starts by hiring one, fancy that! Now, if you are flying into Queen Alia International Airport, you might want to rent a car right at the airport from one of the available franchises in the terminal and drive to your accommodation directly from there. If you plan to stay in Amman, you should know that traffic in the city centre is a bit on the crazy side. Imagine aggressive taxi drivers profusely using their horn for basically everything, lanes doubling or even tripling as needed or pedestrians crossing everywhere. If you already survived driving around Cairo, Beirut or Delhi, Amman will feel like a stroll in the park. But if you are not ready for the challenge, you’ll be happy to avoid the traffic there. Book a hotel in the outskirts and take taxi rides in and out of the city centre. Or take a taxi to your hotel from the airport and rent your car once you are ready to drive away from the capital. By the way, full-to-full in Jordan means you must return the car with the same amount of petrol in the tank you received it with. Do not expect a full tank at pickup. And be ready to head to the first petrol station immediately, which takes me to the next point. Wherever you stay and whatever your plans are, do yourself a favour and book a car with manual gearbox. Or at least make sure you know how to switch your automatic car into sequential mode before you start. 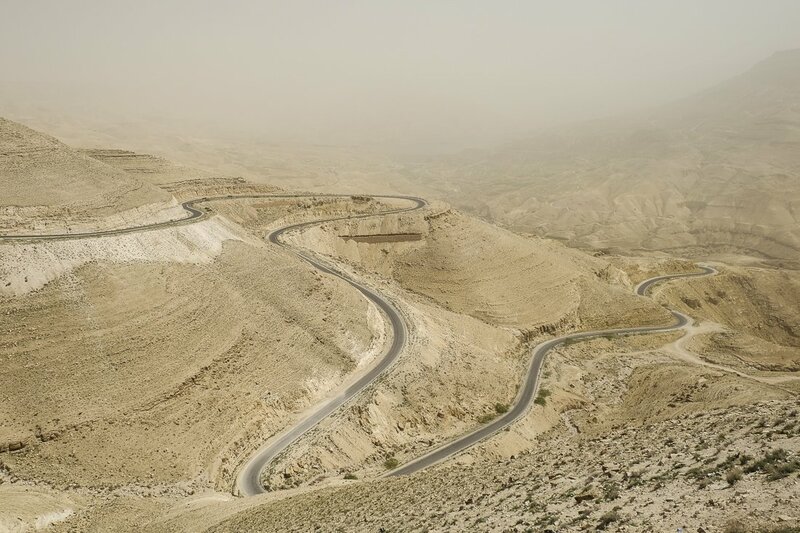 The most scenic roads in the country are quite steep, especially in and out of the Dead Sea basin. You’ll need all the power your car has to offer. For the same reason, do not book from the cheapest car categories if you plan to drive a lot. You’ll find petrol stations everywhere around populated areas. On highways, however, you might not find one in 100km! Always fill up when you have the chance, you don’t want to run out of petrol in the middle of nowhere, do you? If you are like me, you’ll not know what type of fuel you need the first time you pull into a petrol station in a rental car. In Jordan, the choice is simpler, 90 or 95 octane gasoline –90 is fine for most rental cars. Diesel cars are not popular in the Kingdom, and you’ll hardly find one for hire. Most petrol stations are serviced, you don’t even need to leave the car. You just need to open the fuel inlet, tell the operator the type of gasoline you want and the amount you need (full, or the amount of your choice). Easy! When paying for your fuel, give the money and clearly say how much you want to pay, including a tip for the operator. Otherwise, he will tip himself assuming you are a wealthy westerner, and that could be something close to 10JD! Yep, this is how much I gave the first time, and I realised only after counting the change a few kilometres later. You’ll be tempted to take your own GPS navigator or even to book one for the occasion together with your rental car. Last time in Jordan we took our own navigator and found that Middle East maps from big names like TomTom or Garmin are not updated fast enough to keep up with the ever-changing Jordanian road network. Think how much time it will take for you to find your way around unofficial road works and switched one-direction streets. Instead, buy a prepaid SIM card with a suitable data plan from any of the telecommunications shop counters right at the airport (at least Umniah or Zain have shops in the land side of the arrival hall) and use Google Maps on your smartphone. That means, better destination search and real-time traffic situation to safely take you to where you want to be as fast as possible. Also, if you rely on your smartphone, you can always use Google Translate in case your Arabic is not good enough. Credits for this tip go to the kind policeman that stopped us on our way to the Dead Sea. That was after a 200km detour due to flash floods (more on that later). When we were in Madaba, a police control was blocking the road. That route was also closed due to a flash flood alert! We pulled over to consider our options. After a few minutes, our hero policeman came back to us, he knocked on the window and held the screen of his phone towards us. He had used Google Translate to let us know in English that the road was now open and we could proceed with caution. Don’t forget to pack a lighter-to-USB adapter and make sure your rental car has a working lighter or USB connector before you accept it! You’ll be stopped by police several times while in Jordan. This is a fact. Police controls and checkpoints are part of the everyday routine, especially around borders. So much so that you’ll wish to be halted just once more. Far from an inconvenience, being pulled aside by a police patrol is also an excellent opportunity to ask for directions. This is if you’re lost despite your Google Maps trick. Jordanian police, both local and tourist, tend to be very helpful and trustworthy. Keep in mind that police corruption levels are almost non-existent in Jordan. Policemen and women (yes, some are women) are very well considered and respected all over the country. Two main parallel highways serve Jordan from North to South: the 15 (aka Desert Highway) and the 65 (known as the Dead Sea Highway). Winding the mountain ranges between these two routes, the King’s Highway (the 35). 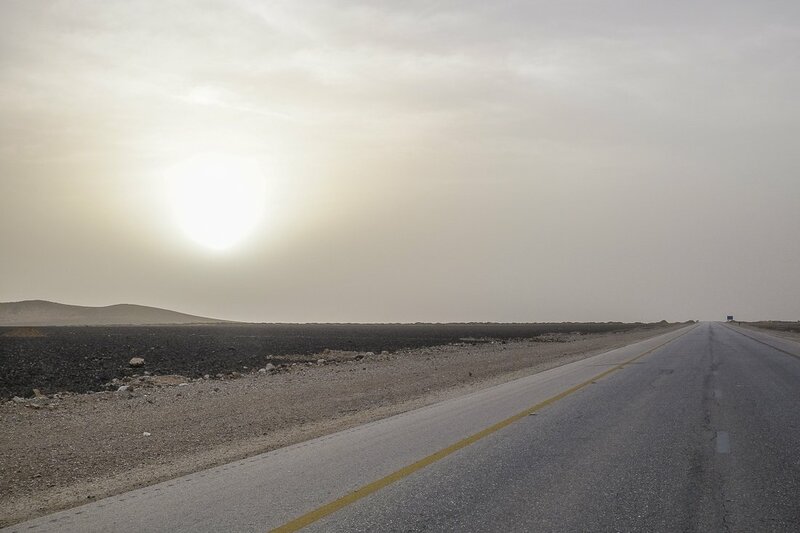 Far from a proper highway, the 35 is a more scenic route from Amman to Petra and beyond. 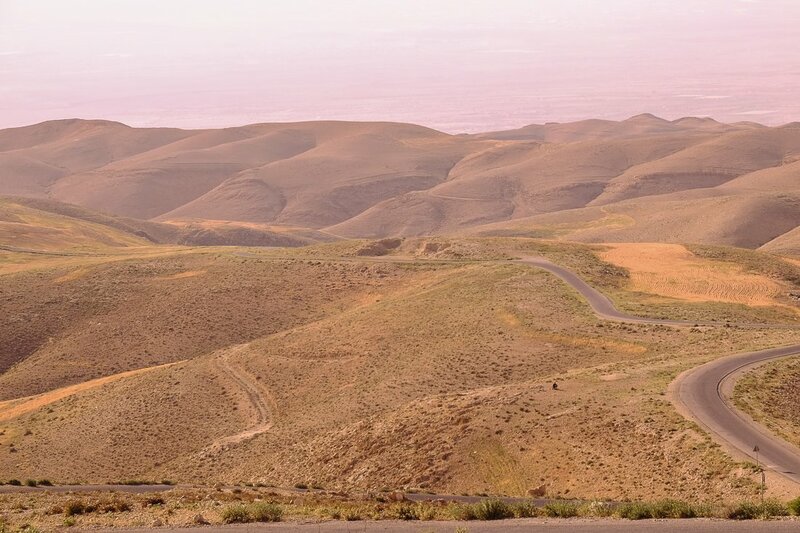 If you choose to take this route, you’ll find yourself driving through untouched towns and the primordial landscape of the Jordanian Great Rift valley. Even if safe, driving on any of the highways of the country is not an easy task. Potholes, speed humps and roadworks are everywhere and might or might not be signed! Besides that, you’ll find many freight trucks that travel along these main arteries every day to and from the Red Sea. They’ll be slow and do not expect them to drive on the right-most lane. We have seen trucks on low gear driving in parallel in the left- and right-most lanes, and cars taking over in between! A last word of caution: You’ll cross towns while driving along highways. Watch out for merging cars and crossing pedestrians everywhere (or goats, sheep, donkeys, horses, camels, you name it)! I still can remember one of our incidents. 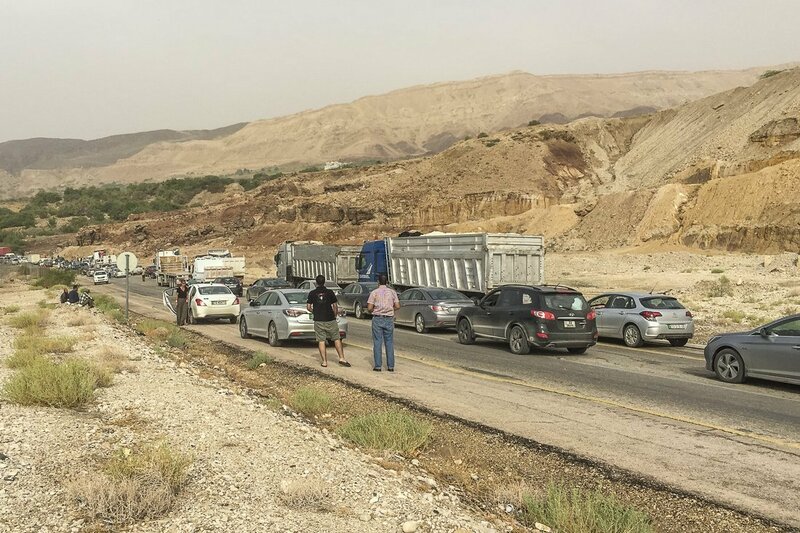 We were on our way to Wadi Musa from Amman on the 15, and as I was bearing right towards the next exit, Michelle realised the paved section of that lane was… well… gone! She started screaming, and I could correct just in time! Again, there was no sign around, eyes always on the road! In another occasion, we were driving north along the 15, from Wadi Rum after our adventure in the desert, towards Wadi Musa and later to the 65. The 15 at this point is a 3-lane highway, quite roomy if you ask me. The tarmac was wet with the October drizzle, and suddenly, on the other side of the road, a full-sized bus started drifting….. one… two… three turns! Time seemed to stop, and by instinct I slowed down with the intention to pull over, ready to jump out of the car in case the worst happened and for whatever we could do to help. After the third turn, the bus stopped without even a scratch as the three lanes were wide enough for it to fit sideways and no car was in the area at that time. Our hearts started beating again. A skilled driver or just luck? For whatever reason, no one was injured that day. However, that impressive episode was a clear reminder that on the road attention is paramount. And this is in Jordan or anywhere else in the world. There is a backroad that links Wadi Musa with the 65. Well, I would rather call it a narrow paved rollercoaster, more suitable for the occasional 4×4 pickup than for our humble mid-range rental car –and crossed way too often by loose goats, donkeys and camels. This boreen is part of what our GPS navigator thought was the shortest way from Wadi Rum to the Dead Sea –not the fastest, as we realised only too late. If you decide to take it, you’ll have a last glimpse of Petra through its back door entrance just after Uum Sayhoun. It will take you over the Jordanian Great Rift and down to Wadi Araba. This is if you feel daring enough, you are hungry for spectacular views and most of all, if you are not in a rush. But we actually were in a hurry. Anxious to get in our swimmers and relax by the pool at our next hotel. Every turn with close to no visibility was painful to take. The idea of having to backtrack was hunting us already. Until the point that we sadly could not enjoy the changing landscape. From the red and polished sandstone formations of Petra to the more coarse dark rock fields beyond and everything in between. The scenery spotted with slender trees here and there and the rare tent of a Bedouin shepherd. Everything against a backdrop of dark stormy clouds and rain curtains on the horizon. When I think about it now, I deeply regret not having taken the time to relish the moment. I wish we had stopped our drive for a minute to get out of the car, enjoy the smell of the rain, marvel at the fine views. And, of course, to take the thousand pictures or so that situations like this deserve. Next time! As we kept driving, already along highway 65, another lesson presented itself. After a 4-hour drive, we were just 15 km from our hotel at the Dead Sea. We were already dreaming of that well-deserved rest. A good lunch and some spa pampering would also be perfect to finish our Jordanian adventure with a bang. The salt-saturated waters were glittering with the afternoon sun on our left. The imposing dry and capricious eroded canyons of the Mujib Biosphere Reserve were standing on our right… only that they were not dry anymore. The first storm of the season had sent flash floods of debris-loaded waters down every gorge in the area and into the Dead Sea itself. It was not too long after the last police checkpoint that we had to stop our drive again. An endless line of cars, trucks and buses were stopped by the road as far as we could see. Yes, no one knew the reason, and yes, we all were stuck there, but the ambience was relaxed. Infused with the local demeanour, we also made contact with a couple of cars near us for information and companionship. The Jordanian driver of one of the cars walked ahead to find out more. We stayed behind with the rest and made the most out of the situation, by approaching a delivery guy also stuck in the traffic for snacks directly out of the back of his truck. Even if those bags of flavoured peanuts were obviously overpriced, nothing could have cheered us up more! Finally, news came our way. Apparently, the murky swirling waters had weakened one of the bridges of the highway and had collapsed, unfortunately taking some lives with it. Also, 21 people (mostly children on a school trip) drowned in a canyon not too far that very same day. Seeing how serious the situation was, there was no way we could drive on that road the last 15km left to our hotel. 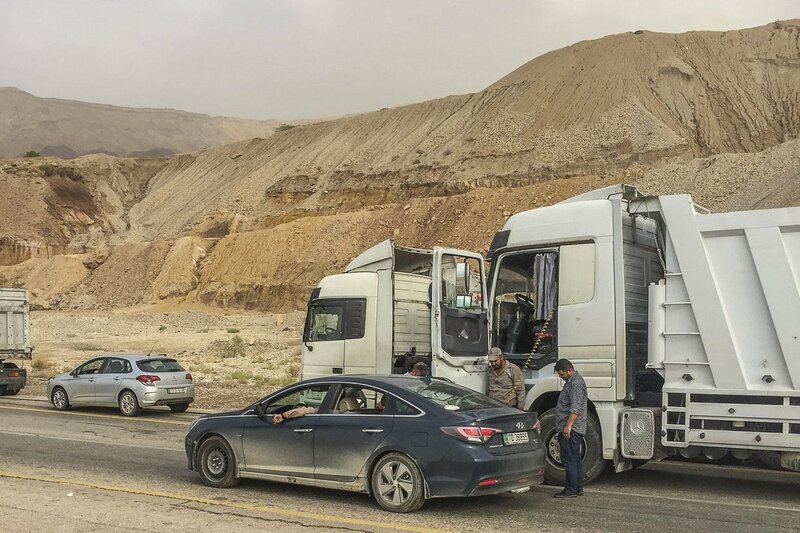 The only option was to backtrack and take a 200-km detour up the winding road to Kerak and through Madaba, following slow trucks and a thousand more cars in the same endeavour… so frustrating! For this post, we got a helping hand from our pal Robert from Onboard Stories. He and his girlfriend Gina drove around Jordan before us and were kind enough to share their pictures and impressions with us in this piece. Head over to Onboard Stories and see what else this couple is up to. Don’t hesitate! If you plan a trip to Jordan, self-driving is the best way to get around. 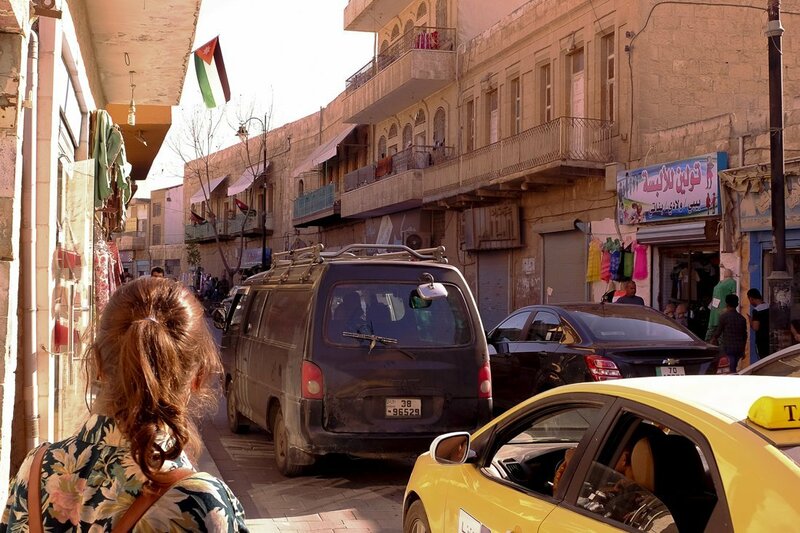 Have you been in Jordan and dared to drive around? Have I missed anything? Let us know in the comments section below. 2 Comments on “Is it Safe to Self Drive a Car in Jordan?”. Join the Conversation Here!